Last week GBP/JPY went down as low as 119.59 and found support there; this was little above the support mentioned by us during last weekend i.e. 119.45, as quoted above. The upward move with this support took GBPJPY to as high as 121.22 before the weekly closing at 121.13. In the coming week if any pull back does not break below 120.20 then we would expect GBP/JPY to have some more upward gains towards 121.90 and possibly to retest 122.05. 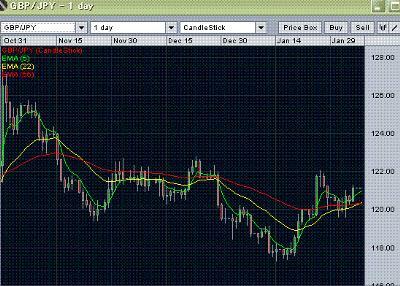 Any strong break above 122.05 should target 122.80 resistance. As we had mentioned during last weekend that the range between 121.80 to 122.80 had proved to be an extremely strong resistance zone during November 2011 end to December 2011 end and we expect this range to have an strong resistance now also and only a break over 122.80 will make us expect any convincing upward gains towards the psychological resistance of 125.00 level. On the downside if GBPJPY breaks below 120.20, it will represent the break of 22-day and 55-day EMA resistance as both are at the same level now and in that case some minor resistance should come near 120.00 which is also the upper edge of daily Ichimoku cloud. And any firm break below this will make us neutral again. In such case we would also expect some further downward move towards 119.20. Though we do not expect it during next week but any break below 119.20/119.15 will make our outlook bearish for GBP/JPY for a retest of the recent low of 117.28. You may also check the weekly gbp jpy forecast and daily gbp/jpy analysis at ForexAbode.